The speakers include Odile Burluraux (Curator at the Musée d’art moderne de la Ville de Paris), Patricia Chen (Writer, Specialist on the Asian art scene), Catherine David (Chief Curator, Centre Pompidou), Sou Fujimoto (Architect), Yuko Hasegawa (Artistic Director at the Museum of Contemporary Art, Tokyo and Professor at the Tokyo University of the Arts), Martina Koeppel-Yang (Independent Scholar and Curator, expert on contemporary Chinese art), Akiko Miki (International Artistic Director at the Benesse Art Site in Naoshima), Kodama Kanazawa (Senior deputy director of curatorial affairs at the Towada Art Center, Aomori, Japan), and Hans Ulrich Obrist (Artistic Director of the Serpentine Galleries, London). 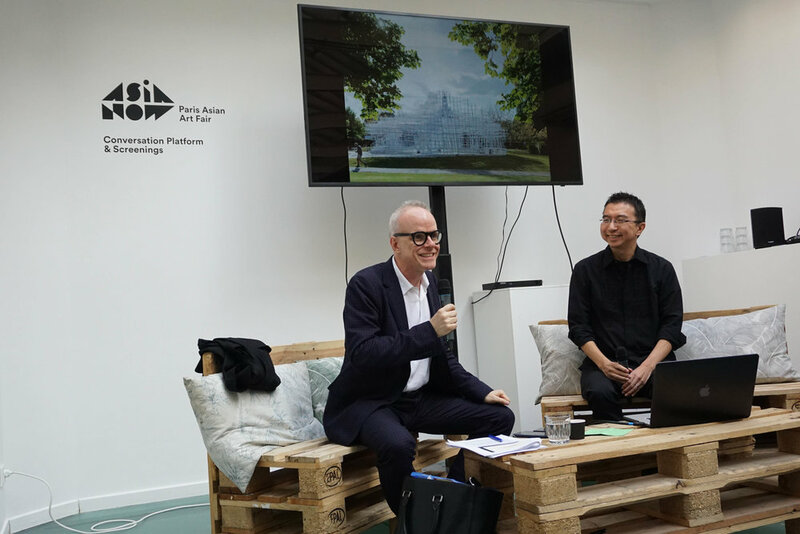 In addition, the École des Beaux-Arts de Paris, in collaboration with ASIA NOW, will organize a special Japanese program including a talk with Makoto Aida, a lecture on Japanese avant-garde photography with Lilian Froger, and a round-table discussion on Art after Fukushima, featuring artists such as Teppei Kaneuji. This Conversation series is complemented this year by an enhanced video programme, presenting video art and documentaries, both by and about artists. Anne Alene organises trips to Japan for top art institutions, including the Solomon R. Guggenheim Museum and the Royal Academy of Arts, as well as for art collectors and philanthropists. The controversial artist discusses his installation, which examines the nature of cities and questions what is the best place to live. 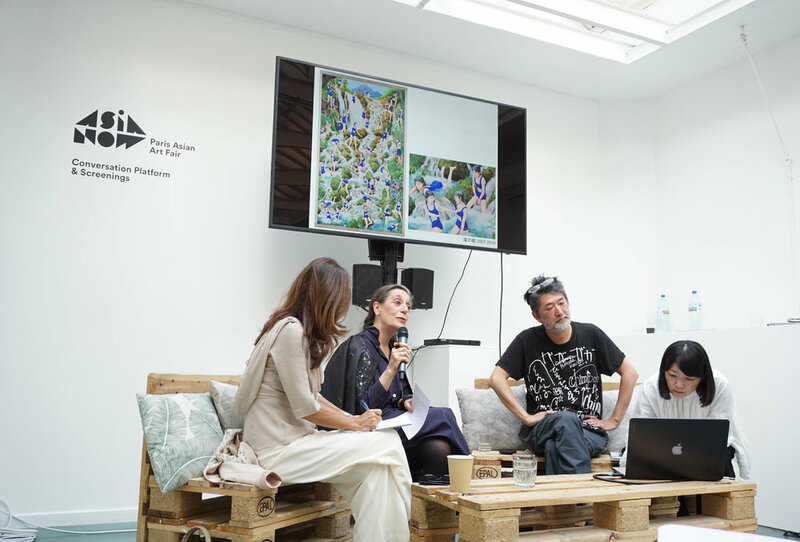 A discussion around the artist’s works, which investigate the mass consumption of contemporary Japanese culture and transcend the boundaries between sculpture and performance. Clélia Zernik examines the creative impulse born from the March 11, 2011 tragedy. Why are there so many art festivals/triennials in Japan? What is the reason for the rise of "community art"? In this talk, Kodama Kanazawa discuss the topic within the scope of Japan's self-imposed cultural imperialism, and introduce the dynamics of art between governments, artists, and local people. Akiko Miki introduces one of the most unconventional collector’s stories in Japan, that of the artist Takashi Murakami, who has been actively engaged in collecting in recent years. Nicolas Trembley presents the exhibition “Mingei: Are You Here?” (Pace London and New York, 2014) and discusses the resurgence of craft and of the Wabi Sabi philosophy and aesthetics in contemporary art with Constantin Chariot and Nathalie Guiot. Wind and Water is part of Felicitas Yang's ongoing project, a series of short documentaries about Chinese contemporary artists. She visited Zheng Guogu's hometown where she filmed three different venues that Zheng conceived and developed as artistic projects. Book signing of Dark Side of the Boom by Georgina Adam - This book scrutinises the excesses and extravagances that arose in the wake of the 21st-century explosion of the contemporary art market. Book signing of Guide Hazan de l'art contemporain by Roxana Azimi - This publication, written by one of the leading French specialists on the art market, aims to guide undecided buyers through the complex field of international contemporary art. Liyu Yeo introduces the works of Liu Bolin and the artist’s his new collaborative project with Ruinart. Fabien Pacory paints a portrait of the new generation of artists in China. This talk examines the evolution of Chinese animated films, with particular attention to the new generation of artists that emerged in the 2010s and are close to contemporary art. A discussion around Reja, Sou Fujimoto’s work on the Serpentine Gallery Pavilion, which is currently on display in Tirana, Albania. The film 24-Hour Art Practice takes a look at Dr. Oei (OHD), a whimsical godfather of Indonesian art who amassed one of the most significant collections of modern Indonesian art. Uli Sigg: China’s Art Missionary traces the journey of Swiss art collector Uli Sigg into the heart of the Chinese cultural space as a preserver and custodian of cultural assets which are not his own. 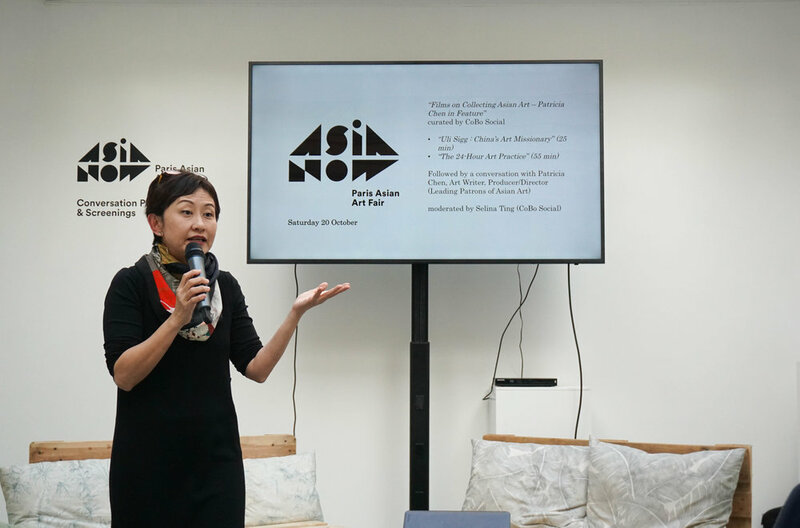 A selection of 25 cutting-edge video works by 20 Asia-based artists will be presented to collectively reflect the shifting perspectives and sensibility of a whole new generation of artists grown up in the rapid economic transformation in the Asian societies. With Selina Ting, director and editor-in-chief of Cobo Social, Isabelle and Jean-Conrad Lemaître, collectors, and Marcella Lista, curator, art historian, director of the new media service at the Centre Pompidou. Takahiko Iimura, whose recent work is presented by Mori Yu Gallery, is a pioneer of experimental video and expanded cinema in Japan. He is close to the members of Fluxus, including Yoko Ono who created the soundtrack to this seminal piece. Trailblazer Yayoi Kusama’s turbulent quest to become a world famous artist is documented in Kusama-Infinity. Born in a conservative family in Japan, Kusama battled racism and sexism in the 1960s New York art scene, to become one of the top-selling female artists in the world today. Yuko Hasegawa looks back on the recent exhibitions she has curated from the perspective of emerging art in Japan. Yuko Hasegawa, artistic director of the Museum of Contemporary Art, Tokyo in conversation with Kohei Nawa. The artist discusses his recent works, including Throne on display in the Louvre Pyramid.